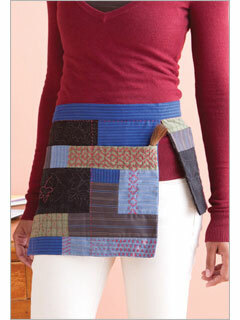 If you’re looking for a fun little project you can make with recycled fabric, sashiko thread, and a little ingenuity, this Sashiko Patchwork Apron Pattern might tickle your fancy. I designed it for the Spring 2012 issue of Stitch and it’s now available for download. The pattern is $4.00, none of which comes to me, it all goes to the publisher, so (correction: apparently I do get a portion, but I didn’t know as it’s buried somewhere in my contract) this isn’t really a sales pitch so much as an FYI. The point of the project is to really get a feel for sashiko. Play with the stitches, try something new, and learn as you go. I had a lot of fun working on the prototype, and I think you’ll enjoy it, too. It’s a great project if you’re the sort who uses an apron in your sewing room or have a child who would enjoy having a few extra pockets for bits of this and that. Okay, here’s a sales pitch: I have tons of sashiko supplies in the Etsy store right now, and I’ve put in another order to replace all the stuff that sold the last time I restocked, just this month! I used a single 40 meter skein of Cranberry thread for this project, but you might want to mix it up a bit with other colors. I’ll take some photos so you can get a better view of the project. There’s a lot going on that isn’t shown in the single picture they used for the magazine.